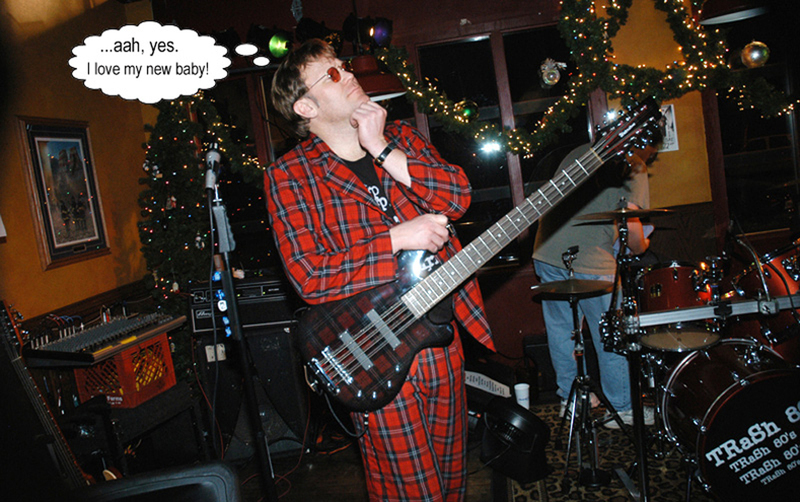 In 2007 Ron Johnson from Rockford, Illinois sent his 12-string bass to Tennessee to get refinished in plaid. Since it took a full nine months for the refinishing work to be done, Ron's co-workers of the PR / Marketing staff at the Rockford Health System / Rockford Memorial Hospital threw him a baby shower in honor of the new addition, complete with cake, ice cream and plaid bow ties. Ron (holding the cake) is surrounded by well wishers Michael, Brian, Chuck, Dixie, Evonne, Wester, Cindy, Laura and Kim; photo by Tom. Insider sources told us that after the sugar buzz from the ice cream and cake kicked in, a frantic game of office basketball ensued with the Shirts narrowly defeating the Skins 21-18. The world’s first cake celebrating the delivery of a long-awaited 12-string bass. Ron had won this Waterstone Ozone 12-string bass in our “The 12 Strings of Christmas Contest” which ended on December 15, 2006. Ron had this natural finish Ozone redone in a plaid fabric by a custom shop in Tennessee. The bass was put into on-stage service shortly after arrival. Scott Pollock's birthday cake featured a replica of his cherry red Hamer B12S 12-string bass. Ron Johnson celebrated a birthday with this nearly scale-sized Waterstone 12-string bass cake made by the staff at Spurgeon's Bay Bar & Grill in Dixon, Illinois. The knobs, bridge and pickups are made of chocolate. Tony Senatore celebrated his birthday with a Rothstein Andromeda 12-string bass cake. Tony told us that the cake was delicious, nutritious and full of positive energy!